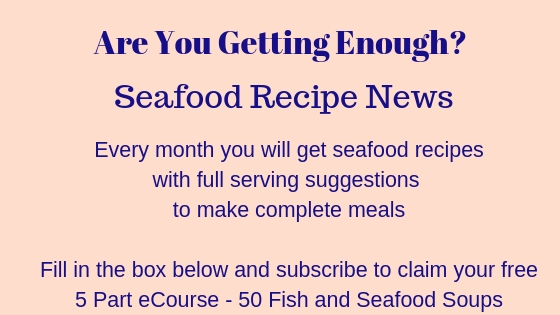 This month's issue of Seafood Recipe News is concentrating on Pasta and Seafood recipes. They're a perfect combination - pasta cooks in less than 15 minutes and your seafood can come straight from the tin or cook or warm through in less than 5 minutes. Sauces are very versatile - you've got tomato based sauces which are very quick and extremely good for you, cream or cheese based. 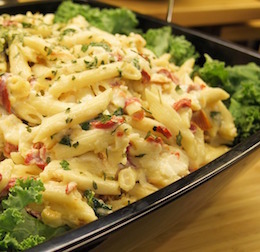 Classic Seafood Alfredo, Seafood Mac'n'cheese, Spicy Tuna Pasta are tasty but so quick to put together. With the kids being on summer holidays, it's a great way of filling up their empty tummies economically at lunchtime. Having to cook an extra meal a day can be quite difficult - time and money both have to be taken into account. These meals are quick and so simple, the older kids could easily put them together for you. And of course, pasta can be hot or cold. 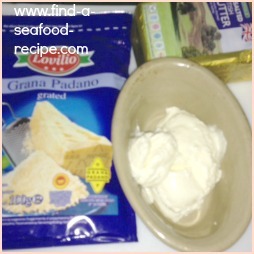 This first recipe for a seafood pasta salad is one of mine - it's so versatile. You can use tinned, smoked or freshly cooked fish, the tomatoes can be sun dried or fresh, you can add corn, cooked peas, you can use different herbs, sour cream or mayonnaise, the choices are yours. Great for a buffet, picnic or a lunch. All of this is ready in the time it takes to cook the pasta - so ten minutes or so. Truly 'fast food' that you can get on the table quicker than you can get to the takeaway. Keep some smoked salmon offcuts in the freezer - put them in 2 to 3 ounce portions - they're so much cheaper than full slices. 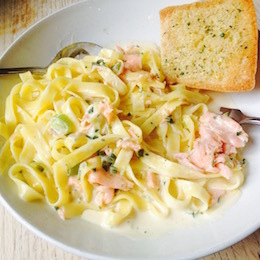 It takes very few ingredients and can be the base for many different sauces - the Smoked Salmon pasta recipe above, is basically an Alfredo with a twist. Add some cooked seafood, capers, herbs (here's a list of herbs to go with seafood) and you've got your own original creation. Shrimp Al Diablo - what a fabulous dish. You'll love Laura's style of presenting, she explains why she does things as she goes - I like that - it's really helpful for people who are learning. This is superb and very quick - you would be proud to serve this for guests at a dinner party. If you prefer to use frozen cooked shrimp - cost is much less - then add a cup of water when she adds her stock and only put the shrimp in for one minute, just to heat through, otherwise they will be tough. 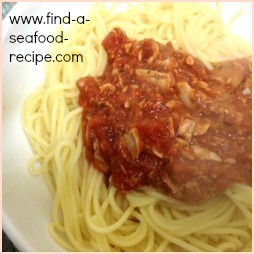 Seafood Marinara is a tomato based sauce with the addition of seafood. 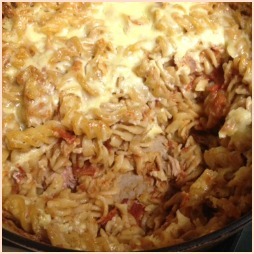 It can be as simple a opening a tin of tuna or a mixed bag of frozen seafood and adding it to the tomato sauce base. You could use fresh shrimp that you have fried off with some garlic and onion - the limit is your imagination - the recipe here, gives you the method for the fresh option. You could make a really simple tomato sauce with a tub or bottle of passata and some chopped herbs, oregano, basil or similar with some black pepper. Add a tin of tuna and you're done. Spicy Seafood Pasta is another one of my creations and a very firm favorite in our house. It is truly quick to prepare and you can add as much chilli powder to the sauce as you like - start off with a teaspoon though and see how it goes. You can use this sauce poured over cooked linguine or spaghetti or mix it in with spirals, shells or short cut pasta, sprinkle shredded cheese on top and bake off in the oven. If I do it this way, then I make extra because it is great cold as well as hot. Wow oh wow! What can I say - Crab Mac and Cheese - what could be better? This video shows you how a top chef creates Mac and Cheese, then at the end, adds the crab meat to make it luscious. If you click on the photo above, you'll see a selection of my cookery books - ones that have inspired, entertained and comforted me from all sorts of food writers. Some purely seafood, but others a little more general - what are your 'go to' cookery books? Drop me a line and share it with me. 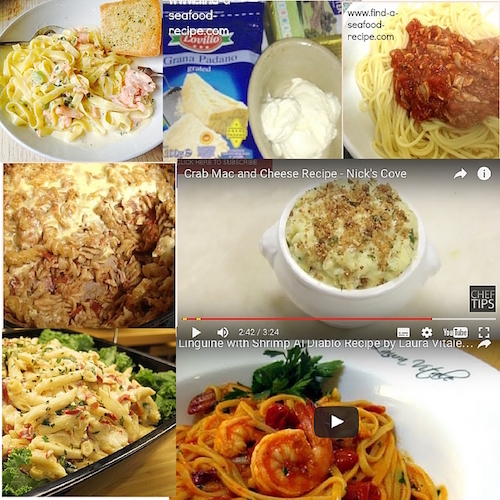 7 Easy seafood pasta recipes that you can serve in double quick time, tasty and nutritious meals for your family.